Fork tender pork in a fraction of the time? 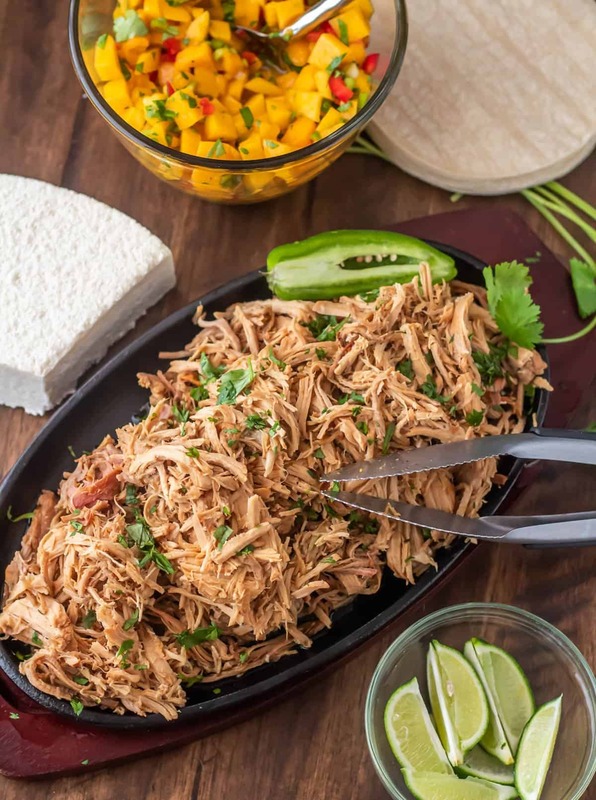 Instant Pot Mexican Pulled Pork requires a few minutes of prep, and 60 minutes under pressure… The flavors of Yucatan in this fragrant, tender pork are perfect for tacos, sopes, and over rice! “Yucatan flavors?” Think beyond heavy, melty cheese-laden Tex-Mex… Yucatan cuisine features bright, sunny, fresh flavor – citrus (especially juice limes and sour oranges), chiles, cumin, annato, cinnamon, cacao, and the most amazing avocados. 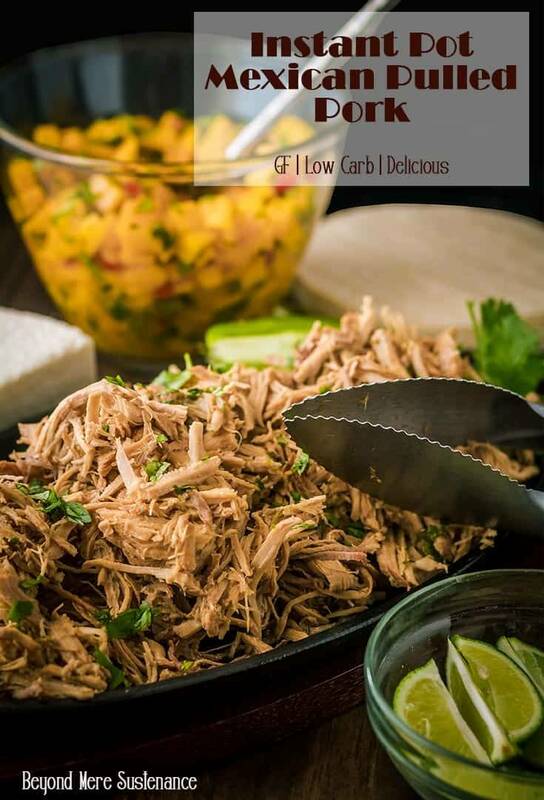 My Instant Pot Mexican Pulled Pork gets its unique flavors from both orange and lime juices, cinnamon stick, cumin, and chipotle. Garnished with fresh cilantro, it is so versatile. And delicious. This recipe is a companion recipe to my Mexican Sopes 2 Ways. Rather than clutter up the post with too many recipes, I limited the post to the Basic Sopes Recipe and a Vegetarian Black Bean Filling. You will see both this Mexican Pulled Pork filling and the Vegetarian Black Bean filling in the Sopes photos. They’re both topped with a delicious, fresh Easy Mango Salsa, avocado, crumbled cotija, and cilantro. Fabuloso! I typically use a small pork loin (4-5 pounds), and we enjoy several meals. The Mexican Pulled Pork freezes beautifully. It’s so satisfying to thaw a zip bag of this amazingly flavorful and tender pork, and have a meal on the table in minutes. Try it with Mexican Cilantro Rice. A simple green salad with Cilantro Jalapeño Ranch Dressing completes the meal. If you have yet to purchase/try cooking with an Instant Pot/Pressure Cooker, what are you waiting for? The ability to brown in the pot makes for less cleanup, and yields more flavor. I prefer pressure cooking to slow cooking for that reason. If you’re already “on board,” what is your favorite way to use it? Do you have a traditional cooking method dish you’d love me to adapt to the pressure cooker? Please leave feedback in the “comments” section at the bottom of this post! I always brown my meat first. The maillard reaction is an important step in achieving the most flavorful results! I brown the pork loin (takes about 5-10 minutes) with the onion and garlic. I add the remaining ingredients, and pressurize 60 minutes. After a slow-release, the pork is ready to shred and enjoy! Fork tender pork in a fraction of the time? 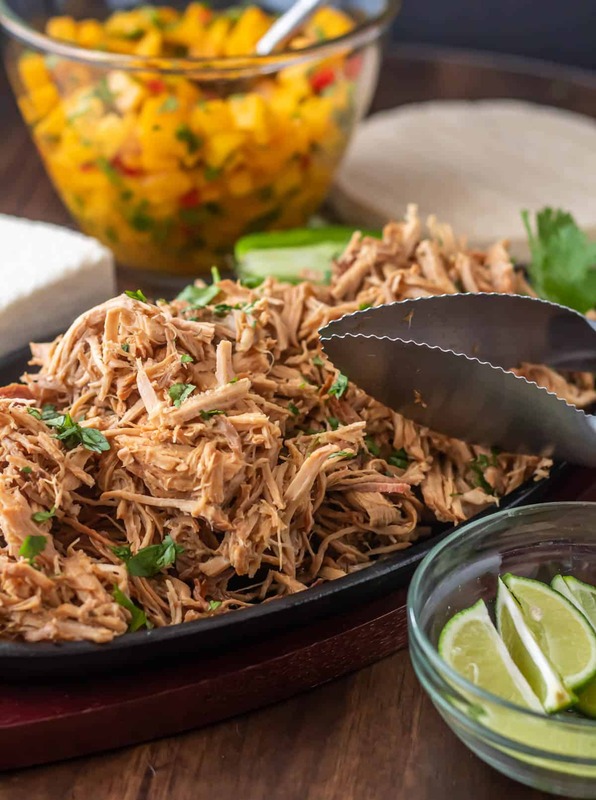 Instant Pot Mexican Pulled Pork requires a few minutes of prep, and 60 minutes under pressure... The flavors of Yucatan in this fragrant, tender pork are perfect for tacos, sopes, and over rice! Cut off any large pieces of fat. Brown pork chunks, onion, and garlic in a bit of oil. Add the minced garlic about halfway into the browning process. This can be done in most pressure cookers. Add all ingredients to the pressure cooker. Pressurize for 60 minutes. Do a "slow release" for 10 minutes (leave it with the valve closed), then release any remaining pressure. Remove cinnamon stick, hunks of onion. Shred the pork. Use in your favorite tacos, sopes, etc. (see post). My Pressure Cooker XL has a "fill line," and it is important to not overfill! The amount of pork and other ingredients will determine how much liquid can be in the pot. You can adapt this recipe to a slow cooker. Brown the pork with the onion and garlic in a saute pan prior to adding all ingredients to the slow cooker. Cook 6-8 hours until falling apart tender. If using a stove top pressure cooker, follow the same procedure. You may be able to reduce the cooking time slightly. I like to leave the pork in the liquid to keep it moist, and use tongs to serve it. Conversely, if serving with Mexican Cilantro Rice, serve it with some of the juices spooned over. Feel free to reduce the liquid in the pot. I don't worry with it. Macronutrients based on 4 ounces of cooked pork: 125 calories; 22 g protein; 3 g carbohydrates; 5 g fat.